In this day and age, money is getting more and more important. While getting harder to earn. So when you’re looking for a chainsaw you don’t want to pay more than is needed. With so many different chainsaws on the market, it gets difficult to know just what the best chainsaws for under $200 really are. 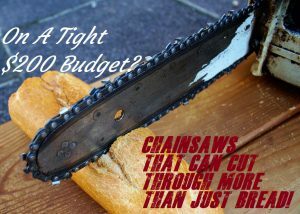 I have found over the years of using chainsaws that the average person won’t need to spend a lot of money on a quality chainsaw, and spending around $200 is the right number. You will be surprised to see just how many quality chainsaws there are for under $200. Finding the right chainsaw for your needs can be difficult, since there is such a variety. The one thing to remember when looking at this price point is that your chainsaw isn’t going to be a heavy duty unit, but it will still get through most if not all of the average home owners needs. If you’re looking for a chainsaw to cut down extremely large trees, you’re most likely going to have to spend a fair bit more then this amount. Tho the chainsaws on this list are all still pretty powerful for there respectful categories. When I was putting together this buyers guide, I didn’t simply go out and find chainsaws that were around $200. I went through countless hours of research reading reviews and testing, so you don’t have to. It is often this kind of research that makes it feel overwhelming when you first start looking for the right unit for you. With that in mind you will find my reviews for the best chainsaws chainsaws for under $200 or thereabouts. 1 What Kind Of Chainsaw Can You Buy With $200? 2 $200 For A Battery Powered Chainsaw? 5 Can You Buy A Gas Chainsaw For Under $200 Or So? What Kind Of Chainsaw Can You Buy With $200? 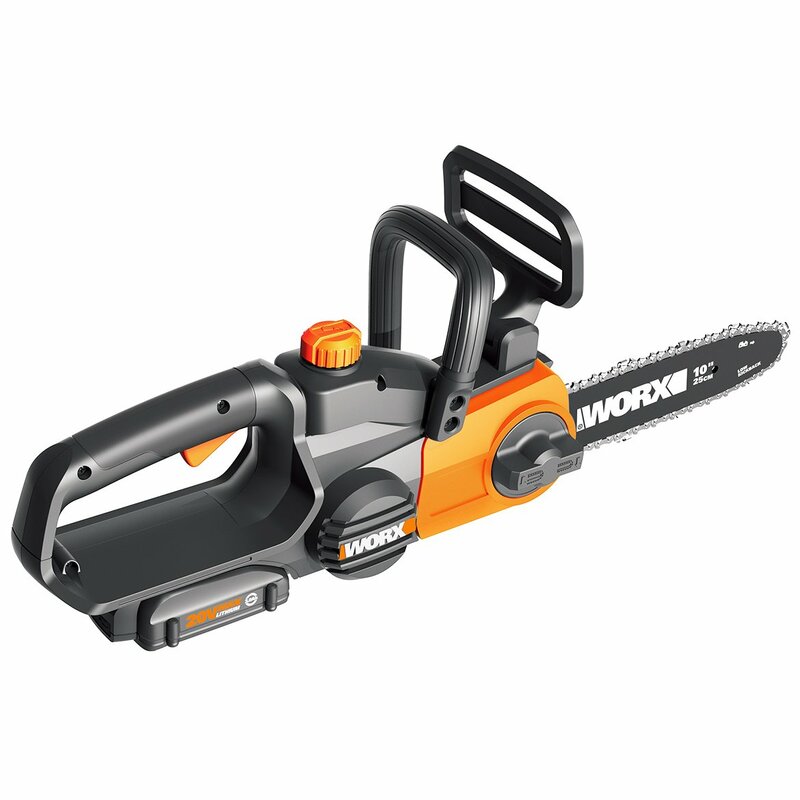 This WORX 10 inch chainsaw is a small beast of a chainsaw that has a lot of versatility and only a minimal downside. It is very light weight and easy to maneuver thanks to weighing roughly 6.2 lb, so it is very portable. 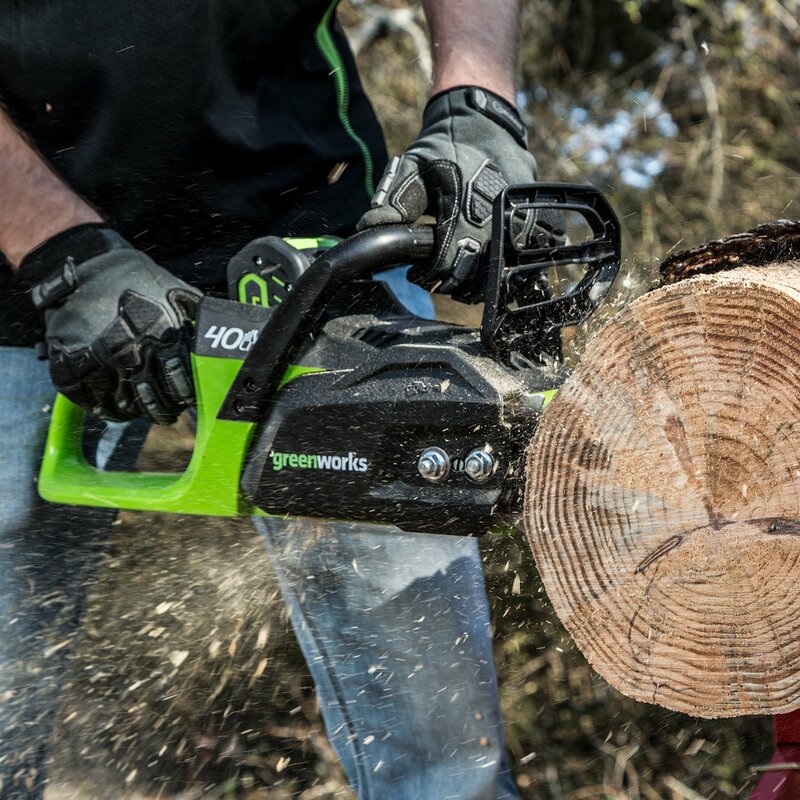 This chainsaw does have some great features that make it great for first timers. For around the two hundred dollar mark, I think it’s feature packed to be honest. A lot of beginners find having to tension the chain on the bar very intimidating, where thankfully this unit has a automatic tool free chain tension system. Which will take some of that first timers nervousness and when you couple it with its automatic chain lubricating system as well. This chainsaw does everything but operate itself for you!. Now I like that! Being a cordless chainsaw has a few advantages and really only one downside at this size of a chainsaw. 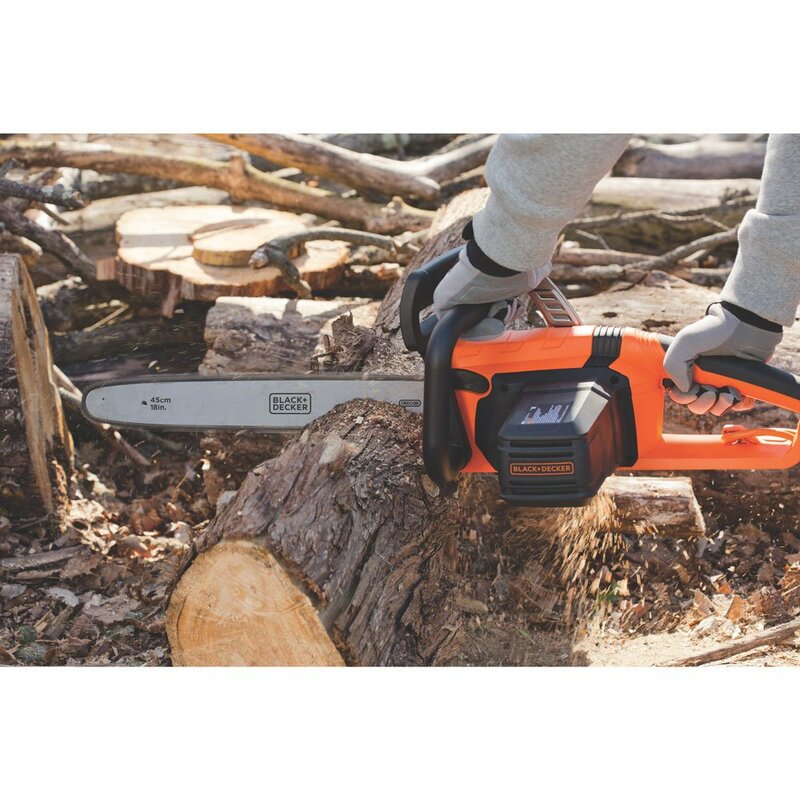 This WORX chainsaw is powered by a 20V battery and while this isn’t the most powerful battery, it still provides it with a fair bit of cutting power. But one important thing to remember about this unit is that it won’t be replacing any larger unit you may own. This unit is perfect for removing tree limbs and pruning, which is where I think this chainsaw excels. I found it worked really well with my 20 inch gas chainsaw which took down the trees, then this smaller unit to remove the branches. There is really only one downside to this chainsaw which is its 20V battery, and while this gives it great cutting power. It doesn’t hold the longest charge, and if you’re doing something that requires the chainsaw to really work. You will find the charge doesn’t last long enough to complete the job with one charge. This is why it’s a good idea to buy a second battery to get more work done in one sitting. If you’re just using it to trim a few small branches and the odd bit of pruning, you will find this battery will last long enough. But if you’re doing something more intense the battery can go as quickly as 25 minutes. So it is a good idea to take into consideration what you will be doing before working. Not having to manually set the chain to the right tension is a big plus for me, while I don’t mind doing it. It was just a nice quality of life improvement that I really like. While a lot of units now days have the automatic lubricating systems, it is still something that is an important feature that is a great selling point. While the battery didn’t hold the longest charge when doing the more intensive tasks, it was still a powerful battery that made it easy to get through some 6 inch tree limbs. The 10 inch bar and low kick back really makes this chainsaw stand out when taking of tree limbs, and lite pruning. $200 For A Battery Powered Chainsaw? The Greenworks 14 inch cordless chainsaw is a great little unit that has an impressive amount of power. This is thanks to the 40V battery that powers this unit, which is a great reliable battery. When you think of batteries the biggest issues you will find are how well does it hold a charge, and how quickly does it charge. It is hard to gauge how well a battery will hold its charge, since a big part of this is how intense are you pushing the unit. If you’re doing something intense with this particular battery it will last about an hour, and about two hours if it is more of a simple job. But it is how quick this battery charges that I really like. It only takes about one hour to charge it, which I feel takes the biggest issue for a battery chainsaw and helps it considerably. This unit is quite powerful and is better for handling tasks that I would consider to be mid range. So it can certainly do more then just remove some tree limbs and lite pruning. It really excels at clearing smaller trees that are 10 inches in diameter, which you can then use for firewood. If you do live in an area that does get a lot of storms and need to do clean up, this chainsaw is great for such a job. I don’t find the 14 inch bar to big so it’s good for getting in and doing some of the more tighter tasks. A lot of larger chainsaws can be heavy weighing close to 20 lbs, which can get tiring having to carry that and then actually using it. Thankfully this unit only weighs about 9.8 lbs which isn’t that much at all, and you don’t get the same level of arm tiredness as other units. While this unit doesn’t have an auto tension system like the model above, it has an easy side access that is easily accessible with very little effort. But it does have an automatic oiling system, which should be on all chainsaws since it is such a great feature that just makes life easier. The 40V battery holds a great amount of charge, for a chainsaw at this price point. But also how quick it charges up, which is very useful if you don’t need to use the chainsaw for very long and need a quick charge. With how versatile this tool is makes it almost irreplaceable for your tool shed, it can handle the easy tasks with no issues, and handle the medium tasks very efficiently. Its 14 inch bar is a good size for doing some of those annoying jobs that don’t give you a lot of room, but large enough to handle some of the bigger trees. Due to being light weight, makes a great home use chainsaw or an alternative for women that want power form a lighter chainsaw. Electric chainsaws are getting more powerful and are catching up to there gas powered unit counterparts. And while this Black+Decker isn’t the most powerful chainsaw on the market, it will still provide you with a great amount of power. This is thanks to its 15 amp motor, which is not only strong but very quiet when operating. Which if you have ever operated a gas chainsaw, then you know just how loud they are. If you live in a more suburban area then it certainly will make you more popular with your neighbors, if you go with an electric powered chainsaw. Being an 18 inch bar chainsaw and having a good motor lets this unit cut through some bigger wood. It can easily handle logs and trees that have a diameter of 10 inches, and it it is a particularly soft wood like red oak it could easily take down a 16 inches of diameters. But the thing that surprised me the most was how it cut up a tree that had a diameter of 26 inches, and close to 6 feet tall. Which only took a couple of hours, but the thing to note about this kind of operation. Is that you should take a break every 15 minutes or so, since this kind of work is pretty hard on the motor which you don’t want to overheat. Being an electric chainsaw has a few advantages that are really useful, and one issue that needs to be mention. The advantage of an electric chainsaw is not only how quiet they are, but also how you don’t need to worry about fuel, or a battery. While that is a great positive it does lead to one negative. The biggest problem for an electric unit is that you need a power outlet and a extension lead. This isn’t hard to come by. it’s once you start to need more then two leads it becomes a bit of a problem. You will need to make sure you have some heavy gauge extension leads to make this less of a problem. This is a powerful electric chainsaw that was able to get through some pretty tough trees, which is thanks to it’s powerful 15 amp motor. This unit was so quiet which is a nice change of pace from a loud gas powered chainsaw. Weighing 12 lbs isn’t too heavy for unit that has this much power, and doesn’t make your arms very tired. This is the cheapest chainsaw on this list, so if you’re on an even tighter budget then I highly recommend this. Oregon is a manufacturer who could of made this list on brand alone, since a lot of the top chainsaws and even the B+D above all use Oregon bars and chains. But this chainsaw didn’t make it on this list because of that, it made it from a great variety of features and one stand out feature. 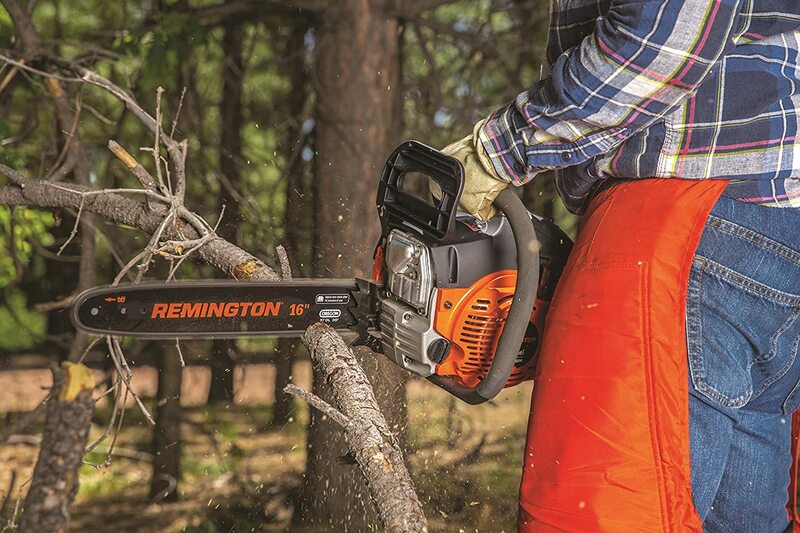 These features are its 18 inch bar, and its 15 amp electric engine all make this chainsaw stand out. Tho it is the heaviest chainsaw on this list weighing about 13 lbs, which is starting to get up there. And since it is electric you will be able to use it for quite awhile, so the weight will start to come into play. Tho if you hold something that weighs 5 lbs for several hours an it will feel heavy by the end of it. There is one feature on this chainsaw that really stands out from all other chainsaws on the market. And that is its built-in PowerSharp chain sharpening system, which is something that is really great and something I want one every chainsaw from now on. What this system does is make this chainsaw currently the only self sharpening chainsaw on the market. All it takes is a pull on the red PowerSharp lever and within three seconds your chainsaw will be sharp. This makes it excellent for people who are new to chainsaws, or just want to make there life easier and not having to sharpen there chainsaw manually. One thing to note with this chainsaw is that I found that you really need to make sure you keep the chain lubed up. Sadly this is something you will have to do manually which can get annoying, but I feel the self sharpening system outweighs this for me so it certainly isn’t a deal breaker. It does come with a tool-less chain tension system which is really easy to use, which is as easy as turning the red knob. Tho I do wish this and the oil were automatic which would make this the perfect tool, but I still feel it does more than enough to warrant being on this list. The first thing which I think is obvious is the self sharpening system. This thing is brilliant and really makes life so much easier, and will even save you money in the long run. While it isn’t automatic the tool free chain tension system is so simple to use, that really makes up for the lack of an automatic system. One thing that I did notice and appreciated with this unit is that it had a surprising amount of low vibration compared to other units. If you have ever used a larger chainsaw before then you know how annoying that feeling can be. Can You Buy A Gas Chainsaw For Under $200 Or So? This chainsaw is pound for pound the best gas chainsaw at this price point, and Remington has knocked it out of the park with this saw. The first thing I have to mention about this chainsaw is that it is really well built, it has no flaws in its internal design in my opinion. A lot of chainsaws will use inferior plastic inside of there units, while this chainsaw uses metal. This is important since the heat in some of these of units can get really hot, and cause some plastics to melt. 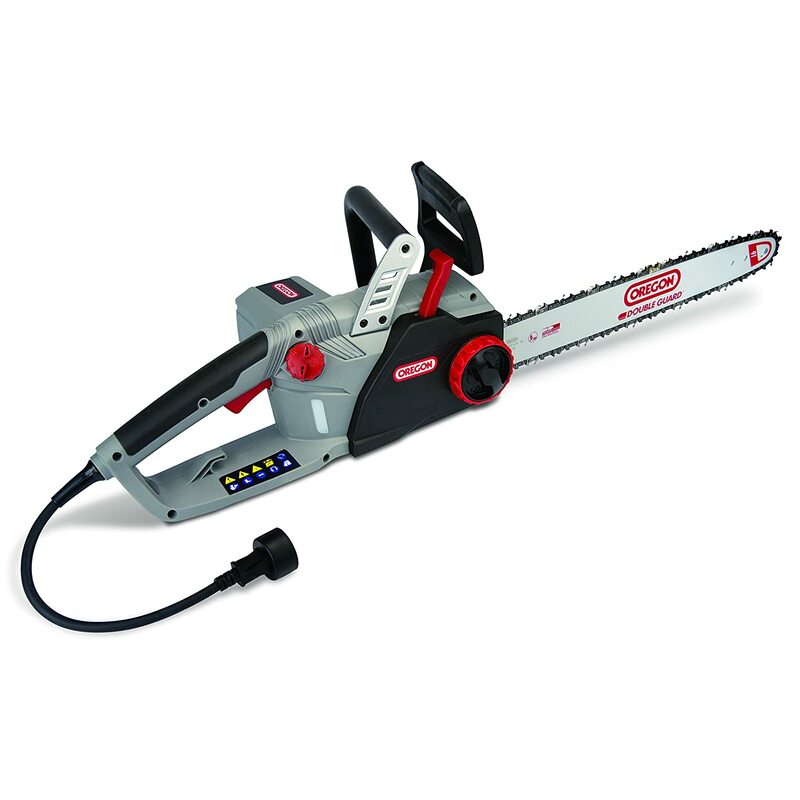 If you’re a bit of a chainsaw hobbyist then this is a great unit for you, it is really simple to pull apart and modify. One of the things that I like about this chainsaw is that it comes in three different bar sizes. While this model is the 16 inch version, it does come in a 14, 18, and 20 inch versions which cost a little more or less depending. This is something I like since it gives you a certain level of customization to help you find the right saw for your needs. Not everyone needs a bar that is 18 inches, and only need 14 inches which this saw covers. Tho I like this saw with the 16 inch bar, I feel it works best with its 42cc engine. This is a very solid and reliable engine that starts up really easy. Especially when you have been running it and let it have a break, then starting it back up is as easy as one pull. It can handle a wide variety of cutting tasks thanks to its powerful engine. This chainsaw can handle some larger tasks then the other units on this list, making it great value for money. Tho it won’t do the largest of tasks, they generally require a heavier duty chainsaw. The advantage of this chainsaw is the fact it is powered by gas. This gives it a lot more maneuverability, and longevity in use compared to the other units on this list. You don’t have to worry about extension leads, and if the battery has charge just the gas. Overall I do prefer a gas powered chainsaw, since you don’t have to worry about the other stuff you do with the other types tho it is louder. While I like the 16 inch bar, I do like that you can get the bar in three other sizes, so you can have the right size for the right job. I do like how this chainsaw could handle most tasks that you throw at it, it easily does the small stuff. The medium tasks are done pretty comfortable, and it can handle a few larger tasks if you’re careful. Chainsaws can be a difficult thing to decide on just whats best for you, but with the units on this list you can feel comfortable that they’re the best chainsaws for under $200 or around this price point. But I do believe that if you have anything to do with wood, then a chainsaw is a tool that you will absolutely need in your shed. Tho I would like to see more manufacturers copy the Oregon chainsaw on this list with its self sharpening system, which is just a great quality of life improvement. Then there’s the B+D that is just so reliable and very versatile which is hard to pass up but it is the cheapest on this list, so if you’re on a serious budget then I highly recommend it. Whatever option you choose, you can be assured that your not over paying on one of these chainsaws. They are all quite affordable and do a decent job for the price.